Your method of travel and/or living situation is going to play a huge factor in your monthly/yearly expenses. I’m going to list some of the more common methods of travel/living below. Costs may vary or be reduced/inflated over time. Please do your research on nomadic life expenses. Tent Camping and hitchhiking – This is the most cost-effective way to travel and live, however, it also provides the least amount of creature comforts and security. Your expenses will be food, beverage, emergency wifi/data, and the occasional misc. clothing/supplies. Tent Camping and bicycle/motorcycle/car – This is a cost-effective way to travel and live, however, it also provides the least amount of creature comforts and security. Your expenses will be repairs and maintenance to your transportation, insurance (If a vehicle), inspection/registration (If a vehicle), fuel costs, food, beverage, emergency wifi/data, and the occasional misc. clothing/supplies. Motel/Hotel and hitchhiking/bicycle/motorcycle/car/van/etc. – This is one of the least cost-effective ways to travel and live. It also provides more creature comforts and security than tent camping. Your expenses will be lodging costs, some motels/hotels charge for internet/wifi, repairs and maintenance to your transportation, insurance (If a vehicle), inspection/registration (If a vehicle), fuel costs, food, beverage, emergency wifi/data, and the occasional misc. clothing/supplies. Keep in mind that if you have a large vehicle or trailer, not all motels/hotels will have parking available. BoonDocking/Urban/Stealth Camping and car/van/truck – This is a more cost-effective way to travel and live, however, it doesn’t provide as many creature comforts or security as a motel/hotel, trailer, or motorhome. Your expenses will be repairs and maintenance to your transportation, insurance, inspection/registration, fuel costs, food, beverage, emergency wifi/data, and the occasional misc. clothing/supplies. You’ll also want to research local municipality laws to ensure it’s legal to park overnight and sleep in your vehicle. BoonDocking/Urban/Stealth Camping and truck with slide-in camper/trailer/motorhome – This is also a cost-effective way to travel and live. Your expenses will be repairs and maintenance to your transportation/camper, insurance, inspection/registration (Except the slide-in, those are not required to have this in most states), fuel costs, propane costs, food, beverage, emergency wifi/data, and the occasional misc. clothing/supplies. You’ll also want to research local municipality laws to ensure it’s legal to park overnight and sleep in your vehicle. Note: The bigger your rig/set-up, the harder it will be to find a legal and safe place to park overnight. RV Park/Resort and truck with slide-in camper/Trailer/Motorhome – This isn’t as cost-effective as boondocking/urban/stealth camping, but it does provide a lot of the same creature comforts as living in a house/apartment. Your expenses will be repairs and maintenance to your transportation/camper, RV/Resort rent and fees, insurance, inspection/registration (Except for the slide-in, those are not required to have this in most states), fuel costs, propane costs, food, beverage, emergency wifi/data, and the occasional misc. clothing/supplies. Note: Not all parks/resorts are created equal. be sure to check out their amenities, rules, and rig-set-up limits/requirements. Deposits on reserving a spot are generally non-refundable. Some parks/resorts provide free wifi/electric/water/sewage/cable included in the lot rent at no additional costs. Your own land and truck with slide-in camper/Trailer/Motorhome – This is almost as cost-effective as boondocking/urban/stealth camping and it does provide a lot of the same creature comforts as living in a house/apartment. Your expenses will be repairs and maintenance to your transportation/camper, property taxes, electric, internet service, insurance, inspection/registration (Except for the slide-in, those are not required to have this in most states), fuel costs, propane costs, food, beverage, emergency wifi/data, and the occasional misc. clothing/supplies. Note: Owning a plot of land somewhere also allows you to establish a home base and mailing address. Rent/Mortgage on a house/condo/apartment and misc. owned vehicles/campers/etc. – This is obviously the most expensive way to do remote work and the most common. So I won’t get into all the expenses included with maintaining a home and everything else, since the point of this journal is to share the most cost-effective way(s) to travel, live, and work remotely, not statically. 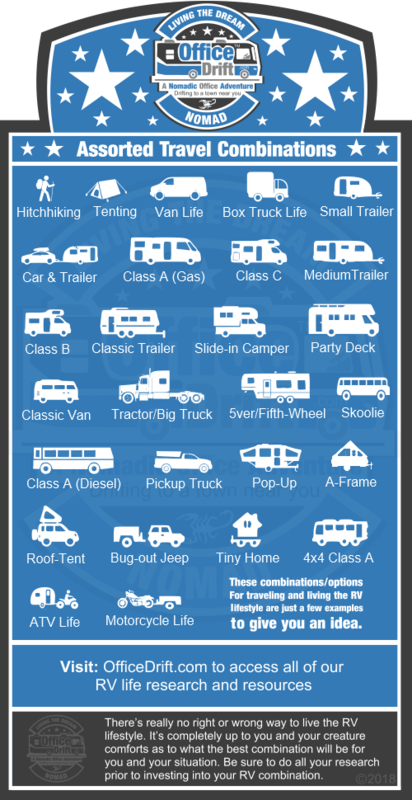 If you’re interested in finding out what the average monthly expenses are living the RV lifestyle, check out our RV Lifestyle expenses overview.